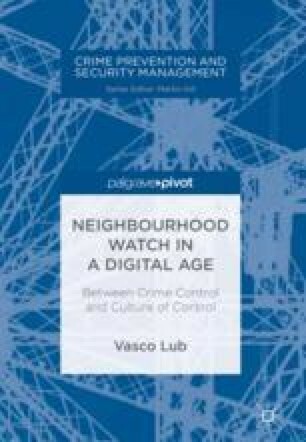 This chapter comprises an ethnographic study of a neighbourhood watch team in the large suburban district of Reeshof in Tilburg, the Netherlands. Currently, 16 watch teams are active in the Reeshof and 800 residents are connected to the wider crime-reporting WhatsApp group. Participatory research was done with the watch team of the V-neighbourhood, consisting of 20 volunteers. Thanks to municipal support, volunteers have access to various technological tools, special clothing and informational material. The case study indicates that neighbourhood watch can generate a deterrent effect on criminal actions and disturbances, provided that many residents are connected to WhatsApp groups on top of the patrolling watch members, mobilising many ‘eyes and ears’. However, this also causes risks of ethnic profiling and excessive social control.